(UPDATE – Elijah was released on bail from prison on Thursday 8 July. He can now be found out and about in Bristol. Welcome back. He remains on bail facing charges relating to alleged threats against Paul Hills, the EDO boss). Monday 7 June at Hove Crown Court sees the long-awaited start of the trial of the EDO Decommissioners, some 17 months after their action to shut down the EDO ITT/MBM arms factory in Brighton. At long last they will have their day in court and, if all goes well, be free from the restrictive clutches of the state. Its not that we’ve given up, or have been too busy participating in the general election. No, the simple reason is that we are a small group, only 2 of us update this blog, and we dont have daily desk jobs that allow regular web access. As a small public group we continue as before with our contribution to political prisoner solidarity and against the growing prison society around us. In practice that means updating this blog, meeting privately and communicating with some prisoners, offering support to a few local activists facing repression, running a monthly public prisoner solidarity letter-writing night, and whenever possible highlighting the importance within our movement of solidarity for those activists and others unlucky enough to face court action and/or get banged up inside prison. 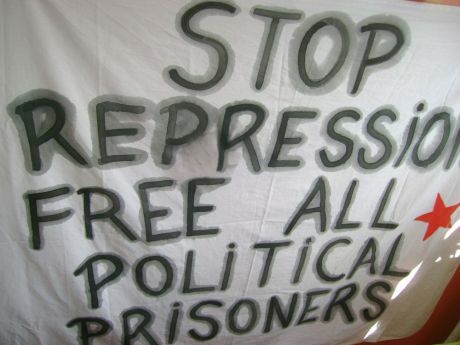 For those hundreds of politically conscious activists in the Bristol area who missed our monthly letter-writing night last night, we produce here our updated UK and international prisoners list prisoners_MAY 2010 feel free to take the time to support one or more of them. Over the last month we have been disgusted by the bare-faced cheek and lies of UK mainstream political parties, and we know that the ‘LibDem-newTory scum coalition’ means nothing but bad news for the vast majority. None of the parties offered any new ideas on justice nor prisons anyway, just the same old persecution, punishment and more prisons. We note prisons went over capacity during the election campaign, at over 87000 prisoners, but the political elite don’t care because in any case they refuse to enact the European Court decision 6 years ago that sentenced prisoners are entitled to vote. For some good insight into the boring mundanity, repression and petty rules of daily prison life check out Prisoner Ben’s Blog. (Note: prisoner Ben Gunn’s most recent parole hearing was abandoned due to deliberate bureacratic malpractice. Ben is currently some 20 years over his tariff). We are appalled that the Decommissioners trial has been delayed yet again, whilst one Decommissioner Elijah Smith continues to languish in prison on remand for 16 months without a trial. We note that justice in the UK remains a distant prospect, as evidenced by the release of a 30 years old secret police report that fingers the cops for killing Blair Peach in 1979, and the fact that over a year after Ian Tomlinson died in London after a police assault, not one cop faces any charges. But we are inspired by the resistance movements in Greece and Thailand, whilst noting the level of oppression faced by comrades in Greece. And we remain inspired by the everyday small acts of rebellion, resistance, mutual aid and solidarity that occur everywhere all the time. Our dreams of freedom and a new world can never be contained in the capitalist systems 5 yearly ballot box. Firstly, as Elijah ‘James’ Smith approaches 14 months locked up on remand, without a trial of course, he’s been given a new prison number – A3186AM. Do please sned in your letters of support and solidarity, and news of any campaigns and stuff you’ve been involved in. Send an SAE too if you’d like a reply. Write to: Elijah Smith – A3186AM, HMP Lewes, 1 Brighton Rd, Lewes, East Sussex, BN7 1EA. Secondly, word reaches us that Robert Alford, one of the Bristol 6, was re-arrested about 10 days ago. After being on remand for months, Robert was eventually allowed out on bail, with an electronic tag, to an address in London. He then moved to an address in Bristol, then a second address and possibly a third, before skipping bail. He is now back on remand, and we’ll add more details when we get them. Or check The Decommissioners. Lastly, some good news. It appears the prosecutors will not be appealing the outcome of the court hearing on 1 March, which means the Decommissioners will be able to present the defence in court that they have always argued for. Game on. UPDATE: Read a report about the Decommissioners court hearing last Monday, by someone who was there. Some good news today on the legal front for the EDO Decommissioners. The Bristol EDO Decommissioner Elijah Smith has been moved from HMP Lewes to another prison. No reasons are known for the move, so it seems likely that its just down to the pure bloody-mindedness of the British state in dealing with a political prisoner. Elijah was transferred to Elmley Prison in Kent around Friday 22nd January and will probably remain there until March we understand. Letters of support remain really important as he’s likely to have less visitors now he’s been moved away from Brighton. Solidarity as ever remains vital for political prisoners. Elijah Smith, VP 7551, HMP Elmley (Sheppey Cluster), Church Rd, Eastchurch, Sheerness, Kent, ME12 4DZ.